Last week, we explored my garden, but I had too many pictures to fit into one post. 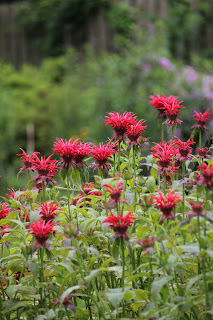 This week is part II, with more photos of my perennial garden. Last year, I tried just the ladybugs--even going so far as buying and installing a ladybug house for them to rest in--and maybe overwinter. 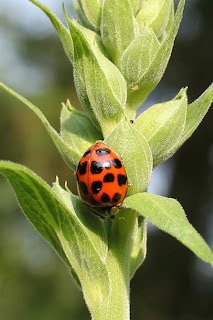 I'm not sure if it worked, but I have seen a few more ladybugs this year than last--and a few less pests. In fact, a few of my plants were attacked, and then seemed to fight off the infestation. Maybe it was the ladies. I am a great fan of vines, and I've planted quite a few. This is just one of the varieties of clematis. 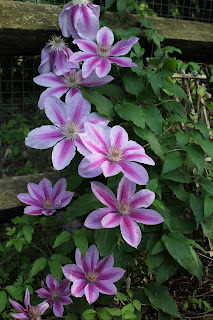 Another clematis, this one growing along the fence. 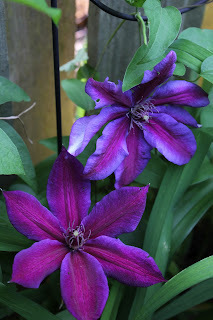 I love the colors in this clematis variety--deep purples and lavenders and dark plums. 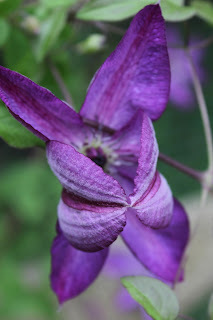 As the clematis flower unfolds, it looks like an empty embrace. 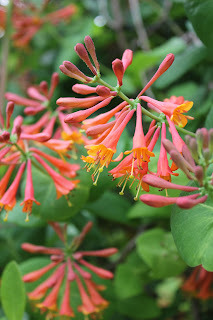 Another vine; a gorgeous honeysuckle. The hummingbirds like these. And yes, it is orange. More orange; every year, I try to grow a few flowers from seed. 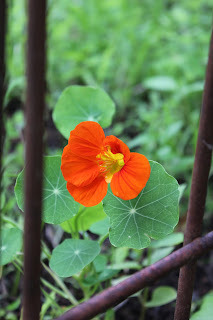 Here is the first nasturtium, which I'm hoping will grab onto the trellis I've placed nearby. I added several varieties of columbine this year. I love their color combinations. Such pretty blooms; why is this plant called spiderwort? It sounds just awful. 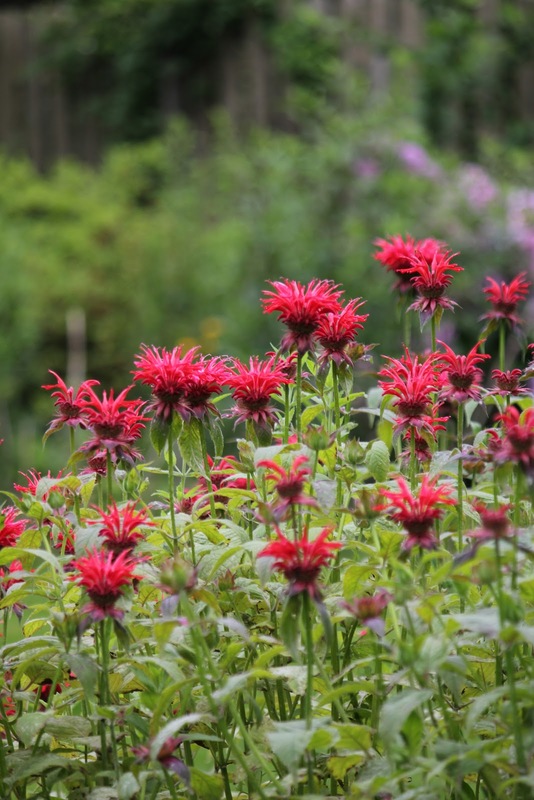 No matter; I have several varieties in my garden. And this is Speedwell. A much more positive sounding name, yet I think these flowers have a soporific effect. I tend to find bees fast asleep on the tall stems. Lady bugs are welcome visitors to my garden, since they love to snack on garden pests. I encourage them to stay with a ladybug house, where they can hang out at night. This bug is probably munching on aphids that want to attack my foxglove. Several days later, early morning rays highlight the foxglove in bloom. Thank you ladybug. 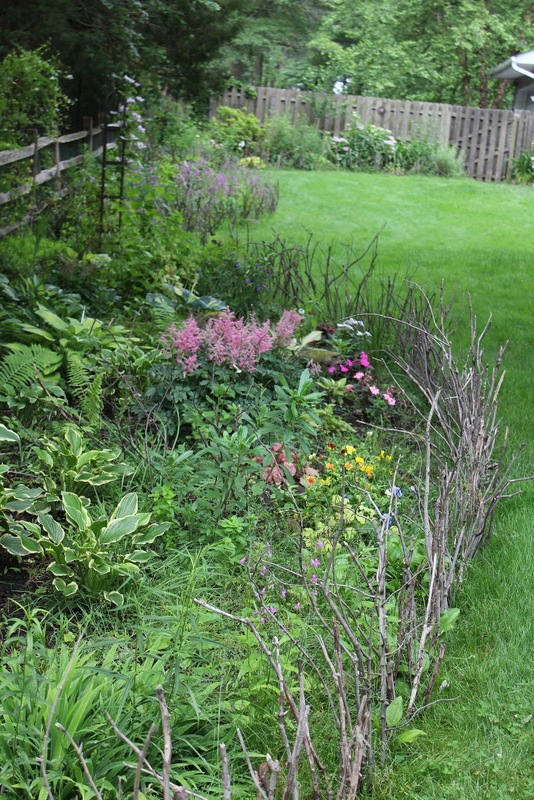 Last fall, I expanded my perennial garden bed. 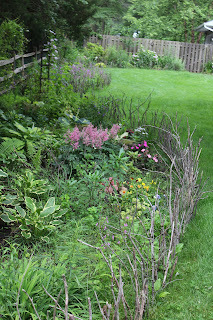 Early in the spring, I began to fill it in and now my perennials grow the entire length of my fenced-in back yard. Plus, there are other beds, next to my house, around my deck, an entire shade garden, next to my shed. Blame the profusion of posies on the deer. For many years, I planted everything that was labeled "deer proof" or "deer resistant. Funny, the deer didn't seem to read the same guides I did. 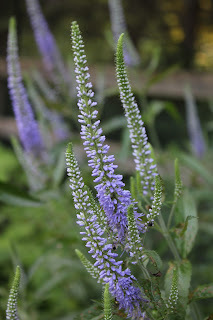 For so long after I moved into our house, the only plants that weren't eaten were my butterfly bushes. And forsythia, daffodils and cat mint. That's all. Everything else was Bambi fodder. The deer ate holly. Holly! With sharp, pointy edges. Mind you, we do have a fenced-in back yard. Keeps the dogs in. But the deer merely laughed as they jumped into my garden of eatin'. Don't start imagining that they needed a running start to clear a 4-foot fence. It was like they were on springs. First they're outside, looking in, maybe two feet away. And then, Sproing! they're inside. So, I bought bunches of pots and dedicated myself to container gardening on the deck. And then we got the deer fence. And I could plant whatever my little heart desired. I think the years of pent-up garden frustration resulted in my going just a little wild. Now that I can plant, I do. And while there are some parts of my yard that are tidy and organized and landscaped, my perennials are allowed almost free reign. So they go a little crazy. And I love it. So does my inner photographer. I spend almost as much time taking pictures of whatever is blooming as I do photographing my dogs and cats. 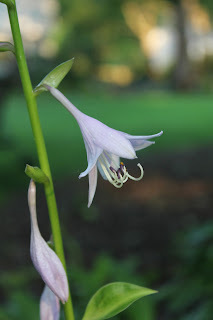 What follows are just a few representatives of my garden photography hobby. 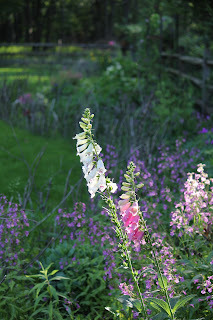 All the pictures are from this year's garden. I like my garden a little wild. My rustic fence is composed entirely of sticks gathered from my yard and woods. It helps create a visual barrier so the dogs don't run amok through my plants. For the most part, the "fence" keeps Tucker, Lilah and Jasper out. Unless there are deer on the other side of the real fence. Or squirrels. Or birds. Or the neighbor. But we're working on it. If I see the dogs running toward my plants, I call out, "Not in the garden!" and they usually stop and gallop back to me, where they get Mucho Treats. 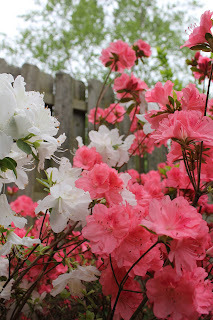 These two azaleas were so chewed up when we first moved in that I thought they would give up and die. I could never spray enough Deer Out (which does work, by the way, when sprayed often enough) to keep the deer from snacking on them. After the deer fence was installed, these beauties have come alive. 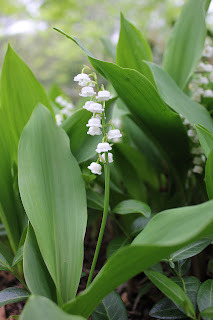 Lily of the Valley: an early spring bloomer. 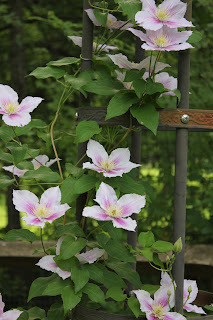 I have these planted several places in my front and back yards. These are extra special because they came from my mom's yard. And, they are one other plant the deer don't eat. 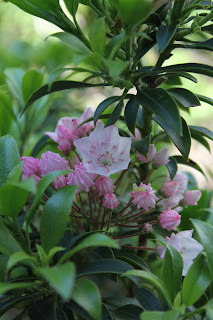 Mountain laurel is on the list of deer-resistant plants--the list the deer don't read. A large bee--and a tiny one--share space on a blanket flower. 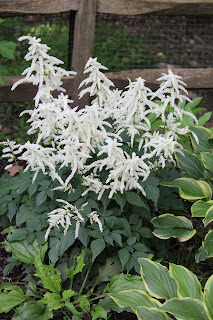 This astilbe has made me into a white flower fan. It just about glows in the dark. I think somewhere I will create a garden with just white flowers. 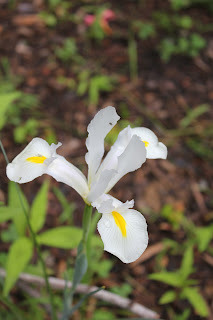 Another white beauty: Dutch iris. These flowers don't mind wet feet from soggy soil, so I try to plant them where the water tends to puddle. 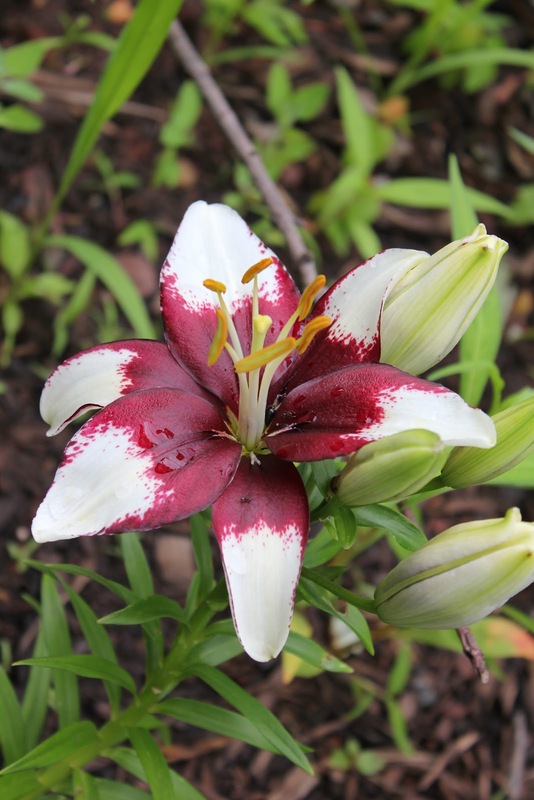 I got this Asiatic lily from Walmart, believe it or not. 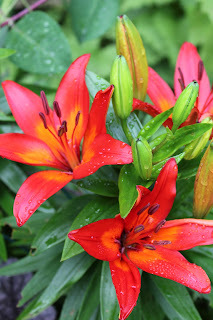 Another Asiatic lily; I'm not normally a fan of orange, but these are so vibrant, they add a bright note to my garden. 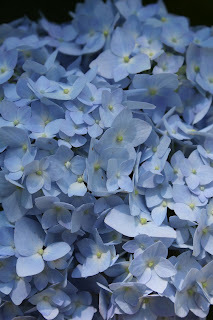 Blue is one of the most difficult colors to find in a flower. Unless you're a hydrangea with the right soil pH. 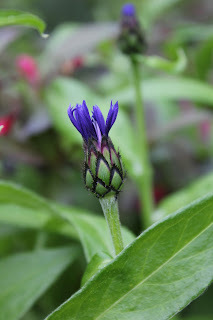 Mountain bluet also shows a shade of blue; other varieties feature different colors. The buds of the mountain bluet remind me of pineapples. There are a few shady spots in my perennial bed; this is where my ferns and hostas are happiest. 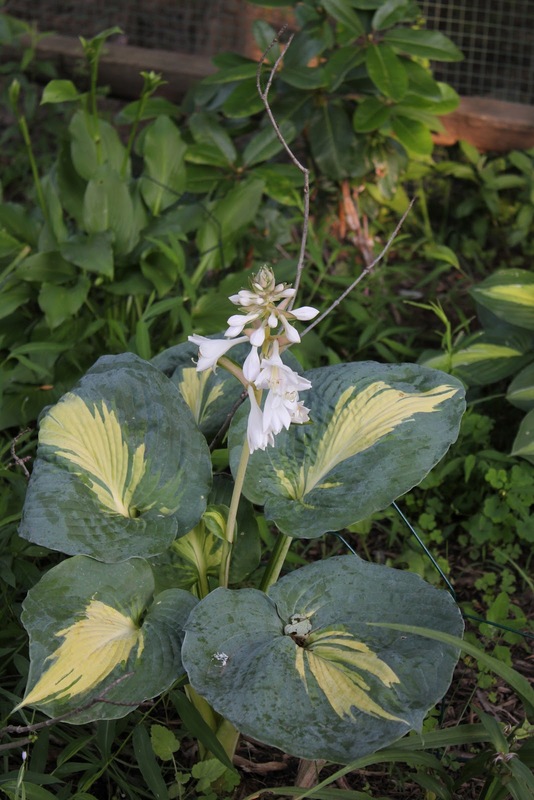 This hosta has huge, thick leaves, and is one of the first to bloom. Even though hostas are grown for their beautiful leaves and shade-loving attitude, their flowers--on tall spikes--are usually a soft shade of lavender. Having culled just a few pictures from my many, many, many, I realize I have more than can be enjoyed in one post, so stay tuned...more to come. Ever since we moved into our house seven years ago, I have wanted to renovate our kitchen. The walls, floor and countertops are so neutral that their very blandness offends. Dark-stained trim invades the room, outlining the ceiling, the soffit, the doors, and bisects the walls in the form of a chair rail. The overall affect is to look like a coloring book that has yet to be touched...just aching to be colored in, if only by a two-year old wielding a fat Crayola. Room by room, we've painted and carpeted, refinished floors, and bought new furniture. And when we were finally ready to do the kitchen--and combine it with the other most-used room in the house, the family room--we had a huge flood in the basement, and all effort and resources went into fixing up that mess. We wound up creating a finished room down there, but were still left with the unused coloring book of a kitchen. That was two years ago, and finally...finally, we're getting the kitchen and family room we've always wanted. Of course, it's a lot of work, and even though we're not replacing cabinets or floors, there are still a lot of details and things to be done: removing our fireplace (the chimney flue is damaged and unusable and we didn't need it), replacing our family room window (for something more energy efficient), taking out part of the wall between the kitchen and family room to open up the space, replacing the counters, putting in a new sink and stovetop, and generally making the rooms more livable. Well, the answer is a bit complex, as would be expected. During the noisy destruction phase, when folks were tearing down walls and breaking down the fireplace into itty bits, Dawn and Athena went to visit my good friends Patty and Dave. For Dawn, it was a trip to hell; she spent the entire time hiding under the couch. We actually had to go rescue her and bring her home because she didn't eat for almost 36 hours. Athena, on the other paw, with no smelly dogs to bother her, and Dawn essentially out of the way, thought Patty and Dave's place was a palace--her palace to be precise. She was treated like the queen she knows she is...and she stayed an extra day because she was so happy, and Patty and Dave just spoiled her rotten. In past posts, I've written about how Lilah used to be terrified of all kinds of things, including tools and noises and new people bringing scary items into the house. She's much better now, but we figured she'd be better somewhere else during the really noisy bits. And Jasper (everybody's Friend) and Tucker (everybody's Helper) would probably get in the way as workmen were hacking things apart and carting them outside. 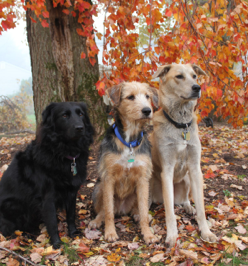 So, the three pups got to spend a day at a home-based doggy day care run by The Pet Professor, Jamie Levin. A friend hangs out with the gang as I drop them off at doggy day care. Hours later, I'm there to pick up a tired (and happy) pack of pups. As everyone came home, each of them discovered the changes in the house. Walls missing. Furniture in the wrong places. Hidey spots gone. And new smells everywhere. Lots to investigate and discuss. Athena approves of the temporary set up in the dining room, which now contains most of the kitchen furniture. The Cat Shelf (that's what it is, right?) is just the right height to spy on a chipmunk hole. Very Convenient. The work continues, and the cats spend the day in our bedroom. 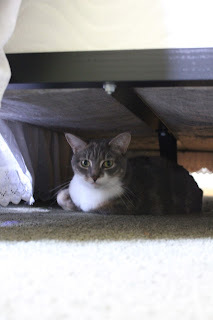 Dawn doesn't mind; she loves the Underbed Cave. Though it can still be noisy since the family room is directly beneath our bedroom. And Athena claims our bed as her throne...just the right size for a cat of her stature. The queen-sized bed in our bedroom is appropriately sized for Athena, the Queen. When there aren't workmen going up and down the stairs to the basement, doing wiring and plumbing work, Dawn finds the basement another appropriate hidey spot. It's particulary attractive, since her kitty condo has been moved down there. Dawn comes upstairs cautiously. There might still be Unapproved Visitors upstairs. And that would be A Very Bad Thing. Tucker, for the most part, goes off to puppy camp at Camp Bow Wow; he needs to be occupied. And Jasper and Lilah stay home, find as quiet a corner as possible, and keep an eye on things. All the contractors and workmen who have been through our home have been awesome with the dogs, and we feel lucky and appreciative of the attentiveness. They've all learned to let Lilah Touch Things With Her Nose so she feels better about new items. And they all tolerate Jasper's exuberant welcome, though they are getting better at not petting him until he calms down and maintains four on the floor--feet that is. Jasper and Lilah inspect Bill the contractor's tools. Athena must inspect the tools as well. Bill Farkas (Core Construction), our contractor, and Bonnie Johnson, (BBJ Remodelers) our builder, are so often visitors to our house, that the dogs treat them as family, greeting them with an exuberance that is second only to Grandma and Grandpa. The dogs, particularly Jasper, just LOVE Bill. Jasper howls with delight when he sees Bill coming. In this photo, the dogs can see him coming up the walk toward the door. Bonnie gets the same treatment when she stops by. Before the wall came down, we took the buffet away. That left Athena and Dawn confused because that's where they ate their kitteh noms. So they found the closest place to hang out. Dawn, framed. And hoping for dinner, soon. With some of the sheetrock removed, Dawn still finds the open frame a good option for resting and waiting for dinner to be served. Athena has assumed the role of Inspector General. Every day she comes down from the throne room...er...bedroom and reviews the progress made while she was holding court. I think she is pleased, but it's hard to tell, as she's a Cat. Athena, Inspector General and Queen. The dogs were a bit unsure at first, with all the furniture moved around. But Jasper found the couch. And as long as Mom was in the room, All Was Right. So it was okay to chill out and relax. "It wasn't me, I swear. I did NOT tear down that wall. Though, come to think of it, it might have been fun." Lilah, Tucker and Jasper find comfy spots to hang out in what's left of the family room. We're only a little over two weeks into the project with many more days to go. It is a continuing adventure. Stay tuned for updates. The hot days of summer are nearly upon us. And if you're a furry black dog like Lilah, you're going to find ways to cool off. Lilah is always the first dog to find a shady spot under a tree. She's also the one who finds mud to lie down in, and will dig a lovely, cool dog bed in the garden. But I think Lilah's favorite thing to do when it gets warm is to go swimming in the doggy pool. On hot days, I'll drag the pool out of the shed and set it up in the shade. Lilah watches the whole process closely, probably because she is somewhat suspicious of the water hose. But once the pool is filled and the hose is removed, she jumps right in. Lilah's favorite activity in the pool is to walk around in a circle, blowing bubbles with her nose under water. Now Jasper and Tucker, on the other paw, well, their favorite thing to do with the pool is to stay far, far away. For two dogs with an aversion to getting wet, a doggy pool seems like utter insanity. Nothing like a wet drippy doggy face. There is often more than one pool out for the dogs. Well, Dog. It's Lilah who plays in both of them. The boys just don't understand the concept; if a bath is torture and rain is barely tolerable, why in the world would you want to put your paws in the pool? Even for treats. Though I have been able to convince them now and again to do it. With treats as incentives, Aaron entices Jasper to get his paws wet on the top step of our in-ground pool. Lilah has already happily splashed back and forth along the top. 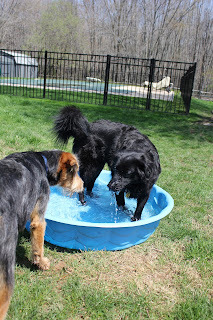 With lots of encouragement and treats, I can sometimes get the boys to put a few paws in a pool. Rarely all four at the same time. Here, Jasper has his two front paws in the water, and Tucker just the one. Because Lilah is aware of the boys' distaste for water, she uses the pool quite strategically. When Jasper and Tucker chase her a little too aggressively, she heads straight for it, leaping in with a big splash. You can hear the screech of tires burning rubber as the two brothers put the brakes on so they don't wind up in the pool with Lilah. She'll slowly turn around in the pool, with a sneaky dog smile, "Why don't you come in, boys? The water is divine." Of course, they don't. Lilah: 1, Jasper and Tucker: 0. A typical score on a warm sunny day. Tucker just doesn't understand the appeal. Fascinated at Lilah's behavior, Tucker still keeps his distance. He doesn't want to get Unnecessarily Wet . On his own, without Lilah to splash him, Tucker investigates. Maybe it's just a giant water bowl? When Rosie was with us, swimming took on a whole new meaning; she loved to jump in our in-ground pool. She'd chase a stick or ball thrown in the water, diving in and paddling back to the stairs with it, hoping you'd throw it again. She was such a pool hound; it was amazing to see her swim over to a float and climb up on it; I don't know how she managed to balance on those wobbly things, but she did. Rosie was In Charge of the pool. If you were splashing too much and she thought she needed to "save" you, she'd leap into the water, and make her way over to you with her scruffy wet nose in the air--and then she'd paw at you until you took notice. And if you kept on being noisy after that, she'd run around the deck and bark. Rosie loved water in all its forms. She used to Help me water my garden, and enjoyed Helping a young Corinne fill up a re-purposed kiddie pool as well. A dripping wet Rosie after a swim in the pool. It's June already, and hot summer days are upon us. I'll be bringing out the doggy pool more often, and I'm sure Lilah will make good use of it. Maybe by the end of the summer, I'll convince the boys that swimming can be fun.